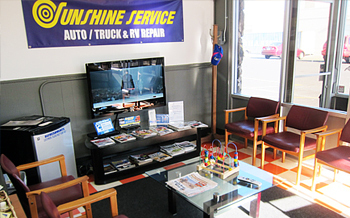 Sunshine Service has always been known as the place to go in the Reno area for anything to do with Brake Service, Front End work, and/or Wheel Alignment since 1951. Sunshine Service uses latest state-of-the-art technology and equipment, which these days even requires that the alignment machine communicate directly to the car’s computer system in order to reset the steering angle sensor. We are committed to stay ahead of the ever changing advances in automotive alignment technology. 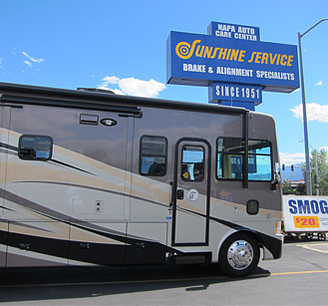 With so many garages in town, why would a Reno driver take their car, truck, or RV to Sunshine Service Brake & Alignment in Sparks? Because they trust us. We’re well-known for being extremely honest and offering the best advice for your time and budget. Such as sharing why something needs fixing now, and what can safely wait until later. Reno and Sparks area drivers also rely on us for their truck, RV, and car factory scheduled services including: alignment, oil changes, smog checks, tire rotation and tire balancing, tire truing, and tune-ups from their 30,000, 60,000 mile to their 120,000 mile tune up and beyond. 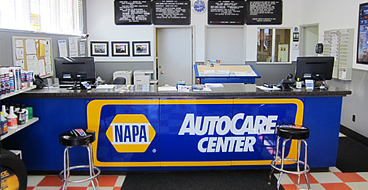 Saving you more time and money, we use the latest computer technology to quickly pinpoint the root of your car problem, then our skilled ASE-certified mechanics fix the problem right the first time. So you can safely be back on road as soon as possible. Our talented team carries extensive knowledge working on any size, make, and model car from Mini Coopers to semi-trucks. And our ASE-certified Master Mechanic overlooks every job to ensure everything from a routine oil change to a complicated engine rebuild is always completed based on the latest automotive knowledge. You save money using us verses a dealer. Get the same factory-specific work done on your car, truck, or RV – but for a lot less. With so much technical experience and integrity, you can safely bring in any make and model: Ford, Chevy, Chrysler, Toyota, Mazda, Kia, Honda, Suburu, Mercedes, Audi, BMW, Porsche, Infiniti, Lexus, Holiday Rambler, Winnebago, Airstream, and more. You can extend the life of your car by getting regular services done right with high quality parts from oil changes to tune-ups. Our thorough 27-point inspection makes sure even the overlooked “little things” work correctly and get replaced before they break down and cause more expensive issues later. 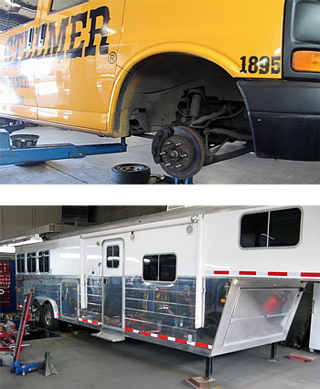 Our specially designed bays and RV mechanical team are skilled and equipped to diagnose, service, and repair any RV or trailer residing in Reno/Sparks or just passing through. We service every make including: Rexhall, Winnebago, Airstream, Lazy Days, Northwood Manufacturing, Tiffin, Newmar, Jayco, Nu Wa, and Fleetwood. For more on our RV Services CLICK HERE. Your employees and customers rely on you to keep your fleet cars and trucks working dependably. You can rely on us to keep you’re your fleet safe, running efficiently, and working at full power. You’ll receive accurate estimates, regular maintenance schedules to help extend the life of your fleet, and regular updates while we’re servicing your vehicles. So you can manage your fleet efficiently while we get them safely back on road as quickly as possible. Call now for prompt service: (775) 358-5486.